Yesterday it dawned on me that I don’t clean my coffee maker as often as I should. Without a good cleaning every now and again, your coffee maker won’t operate efficiently and you just aren’t going to get the best cup of joe that you can. You don’t need fancy-schmancy coffee maker cleaning tablets. You don’t need a special filtering system. You can clean your coffee maker for less than a buck. You ready…? 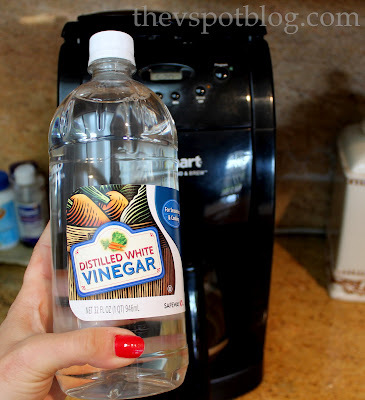 Simply pour about 2 cups of white vinegar into the machine instead of water and start the brewing cycle. (Be sure there are no filters or old coffee grounds sitting around. Hot vinegar smells bad enough… hot vinegar and old coffee grounds will make you head for the hills. ew. You’ll see flakey looking particles or floaties in the hot vinegar. Pour out the hot vinegar and repeat this process two or three times, until there are no more floaties in the pot. Run a cycle or two with clean water to rinse out the machine and you’ll be amazed by how much better your coffee maker will work. I also have a great tip on a no-scrub way to clean your stove burners using just a little bit of ammonia. 1. Cute red nails. 2. Ooh, I really need to do this because now I’m seeing my coffee pot and…ew! i just bought a huge jug of vinegar last night. I am just now schooling myself on the joys of cleaning with vinegar, baking soda, and lemon juice, but this is one of the few I already knew because my mom always did this. Still, it’s pretty freaking cool. And your nails ARE super cute. any idea if this would work in a Keurig machine too? I’ve heard about this tip and have been wondering if it actually works or if I would still taste vinegar in my coffee. So good to know now that it works! Definitely trying it! Thanks for the great tip! I’ll be cleaning my coffee pot tomorrow! I saw your share at The Frugal Girls Chic & Crafty Thursday – I’m a new follower. Have a great Friday! I was just thinking today I needed to look up exactly how to clean my coffee maker. I remembered it from when my Mom used to clean here, but just couldn’t remember the process. Thanks for sharing this tip. I just used white vinegar in my dishwasher to remove the stale odor…pour some in and run a rinse! I think vinegar is a bit of a miracle liquid! Thanks for this great tip! Every time I walk to my coffee maker I get a waft of nasty smell, even though I’ve tried washing it. I’m going to try this tomorrow! Hey that was excellent to read. Thanks for the wonderful post .Loved every single portion of it. Always wondered about an easier way of doing this, thanks a ton for the info! I do this with my coffee pot at least once a month. I pour the old vinegar that I just used to clean my coffee pot and pour it down the shower drain, sink drain, kitchen drain, which ever one you feel needs it. The shower with all the shampoo and soap scum is usually the worst. Thanks for all your tips, keep them coming. I have a 6 burner stove and my grate is 2 burners in one. So I will try this with a store plastic bag, since the regular zip lock bag won’t work for me. I will tie it up tightly. Looking forward to this hint. I am usually to blogging and i really recognize your content. The article has actually peaks my interest. I’m going to bookmark your website and hold checking for new information. WhatHappening i’m new to this, I stumbled upon this I have found It absolutely useful and it has aided me out loads. I hope to contribute & aid other users like its aided me. Great job. I pour the old vinegar that I just used to clean my coffee pot and pour it down the shower drain, sink drain, kitchen drain, which ever one you feel needs it. The shower with all the shampoo and soap scum is usually the worst.